Seattle sports fans finally have something to cheer about. 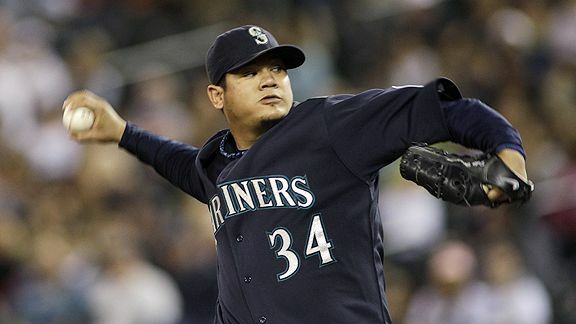 Felix Hernandez has won the American League Cy Young Award. This award is given out to the best pitcher in the league for that year. In the midst of a terrible year of baseball for the Seattle Mariners, 'King' Felix was the lone bright spot. Each time he took the mound, he offered the team and the fans a chance at victory. For that, we are incredibly grateful. Felix being voted this award marks a turning point in baseball history. Traditionally, the number of wins a pitcher has for that year is one of the primary statistics used in determining the Cy Young winner; but not this year. Felix ended the year with only a 13-12 record, while CC Sabathia had 21 wins and David Price had 19. The difference, however, is that both those pitchers play on significantly better teams that score significantly more runs. Felix plays for the Mariners, who scored the least number of runs of any American League team since the addition of the Designated Hitter position in 1973. LOWEST RUNS SCORED IN 37 YEARS!! Meanwhile, Felix dominated in nearly every other statistical category for pitchers. He pitched the most innings of anyone, had the lowest ERA, and was second in strike outs. He also led the league in 3 or 4 other more complicated (yet quite important) statistical categories. He deserved to win this award, and in doing so, we have seen that the voters are no longer stuck in their traditional thoughts of merely basing their votes on the win-loss record. Thanks for making history, Felix. You earned this award. Thanks for giving us Mariner fans something to cheer about and a reason to show up at the ballpark.